Well, maybe not really a band (no tour schedule) but more of an indie music studio project formed by "Munk Marvelous." Still there's a great logo, a MySpace site and some very interesting tracks featuring layers of kazoo and percussion ("homemade drums and various other household objects"). Check out Heartbreaker, Beat It (eerily sounds like Michael Jackson himself is kazooing the melody), Ironing Maiden, and Roxanne - instrumental covers of some great songs in a style reminiscent of the Temple City Kazoo Orchestra. Hailing from Van Nuys, CA, KAZOO is showing the world that the kazoo rocks. I'm hoping they get picked up for some major label distribution and maybe a tour with Weird Al. As a weekly feature we'll spotlight some of the great vintage kazoos (at least until we run out of great vintage kazoos). This week it's the 1939 New York World's Fair Kazoo produced as a souvenir of that auspicious event. Manufactured by The Original American Kazoo Company in Eden, NY, it is known as the "Trylon and Perisphere" Kazoo, because it resembled the famous structures at the Fair. A smaller round kazoo was also produced as a souvenir, but this one is cooler. In fact, one of these vintage kazoos appeared on eBay and failed to sell at nearly $250.00. 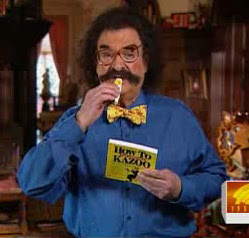 Gene Shalit Picks "How To Kazoo"
Today show commentator Gene Shalit picked Barbara Stewart's, The Complete How To Kazoo, as one of his Top Ten Holiday Books for family gift giving. Gene even gave us a little kazoo playing on national television. And you can't have too much kazoo playing on national television. Thanks, Gene and Happy Holidays to everyone at the Today Show on NBC. 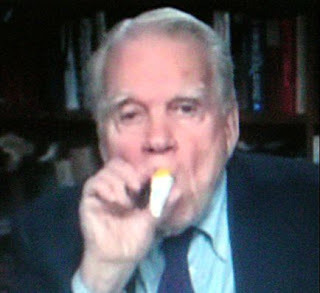 Andy Rooney likes to talk about stuff. Everyday stuff. On December 10, 2006, Andy talked about all of the "junk" he receives in the mail. So much junk. Poor Andy. Along with a copy of Barbara Stewart's new book, The Complete How To Kazoo, Andy got a "professional" quality kazoo. "I wouldn't want an amateur-quality kazoo." he reflected. Now I don't want to delve into a deep philosophical discussion about what constitutes "professional" or "amateur" when it comes to kazoos, but let's just say that quality comes down to the player. Just having a "professional" quality kazoo doesn't make one a professional player any more than having "professional" quality eyebrows makes one a professional commentator. Although you'd have to say that Andy's got "professional" quality eyebrows. With toe-tapping rhythms, uproarious lyrics, impeccably tailored outfits, and perfectly charming manners; The Two Man Gentlemen Band is nothing if not fun! Whether they're performing in a city park, on a subway platform, in a lively pub, or a quiet listening room, the unstoppable duo of Andy Bean and Fuller Condon always gets the audience smiling. The Gentlemen combine jug-band, swing, country, dixieland, bluegrass, gospel, jazz, and old-time styles to create a two-man sound that is all their own. Unwilling to confine themselves to one genre, The Gentlemen describe their style simply as "Good-Time Music." The band’s shows are rowdy, interactive affairs. The Gentlemen travel with huge boxes of kazoos, which they distribute for free at every performance. Audiences are encouraged to kazoo and sing along as much as possible. The Seal Beach, California, Christmas Parade featured more than 70 youth groups, drill teams and marching bands. But for many spectators who attended, the main attraction of the night was that shirtless man holding up a toilet plunger and leading a group of kazoo players. “He’s a character,” said Stan Anderson, parade organizing committee member. Anderson was referring to Michael Brief, leader of the Almost Famous Seal Beach Kazoo Marching Society Band. For more than 20 years, Brief has led a group of 20-30 white-clad kazoo players in the annual parade. The bandleader himself marches down the parade route shirtless, wearing pink tuxedo tails, a white bowtie, white shorts, white gloves and pink sneakers. For a baton, he waves around a toilet plunger. Is there any benefit to 60 people performing Christmas music on kazoos? That's the fundraising question those wacky "It's a Kazoo Christmas" creators Rob Radencic and Jennea Stewart are hoping to answer. The friends, along with a handful of volunteers, are trying to round up enough musicians willing and able to perform Christmas carols in perfect harmony over the bustle of holiday shopping at downtown's Pioneer Courthouse Square. Keep up with the Kazoobie Kazoos news and news about kazoos from all over the world.